Our retro dinette sets are built to last! All are of commercial quality and we are proud to say, designed and made in the U.S.A.
Our retro dinettes provide comfortable seating for your home or restaurant. Create your very own unique look with any combination of vinyls and laminates, or select from any of our pre-defined sets. 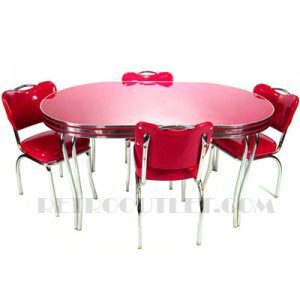 You will find that Retro Outlet has the highest quality diner furniture at the lowest prices online. Please allow 4-6 weeks for production of your dinette set in your choice of materials!